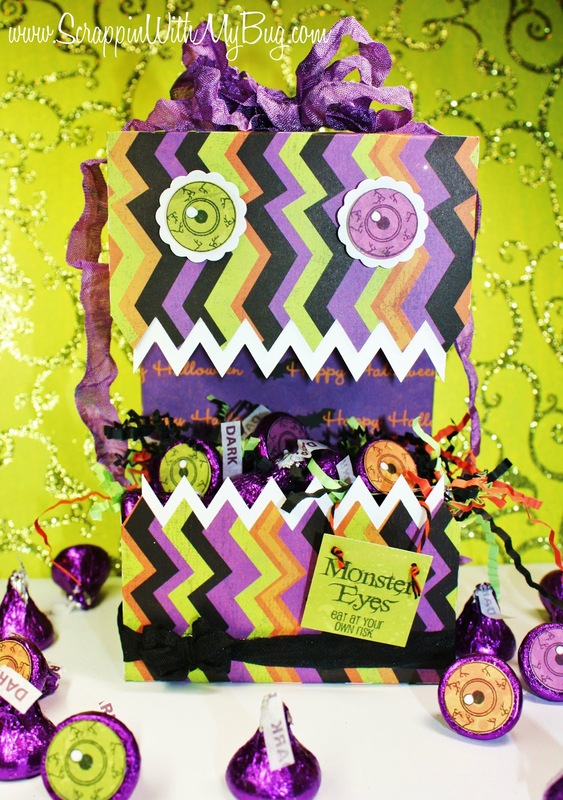 Monster Mash Blog Hop !! If you just came from 3 Girl Jam then you are in the right spot... if not go to 3 Girl Jam to start at the beginning. I created my own Monster from a SVG of a box. 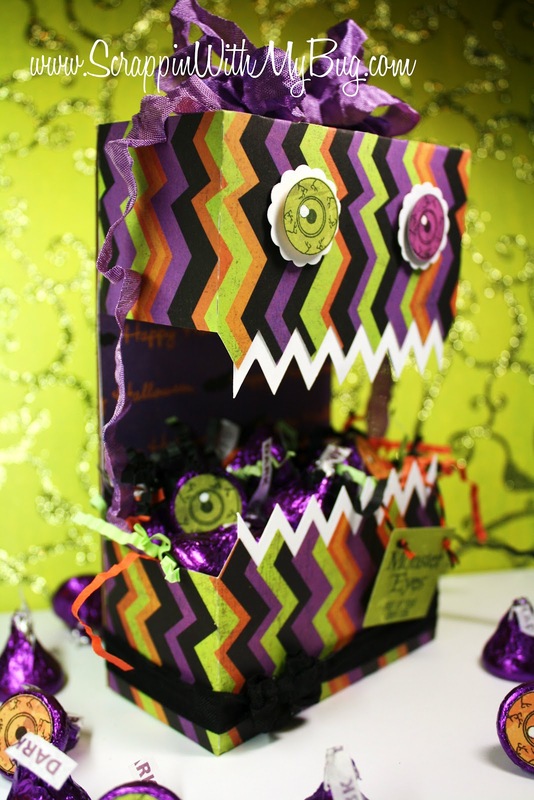 I used 2 boxes from My Scrap Chick and turned one upside down to create a mouth. Then I reinforced the back with chipboard. I of course used the Jaded Blossom Monster Mash stamp set. I used it for the sentiment as well as the eyes on the monster and the eyes on the Hershey kisses. 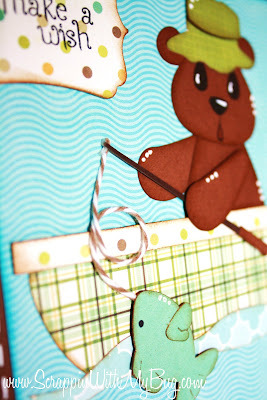 Close up of the tag I used Trendy Twine Orange Licorice to hook it around the tooth. 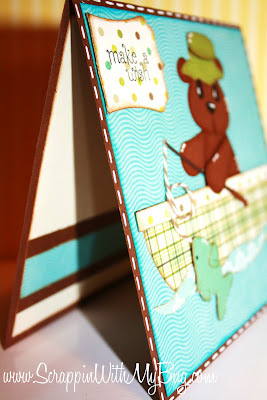 Just wanted to share a little birthday card I made. 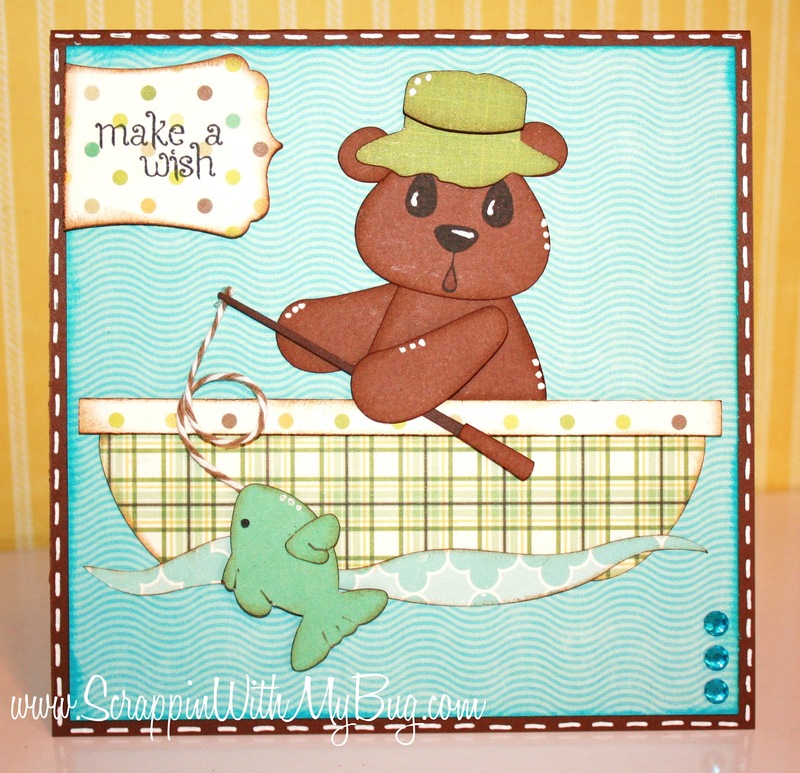 I used of course a Jaded Blossom sentiment from their birthday set "Make a Wish"
Also a SVG file from Little Scraps of Heaven, Peachy Keen face stamps for the bear, Echo Park paper and twine from the Twinery. 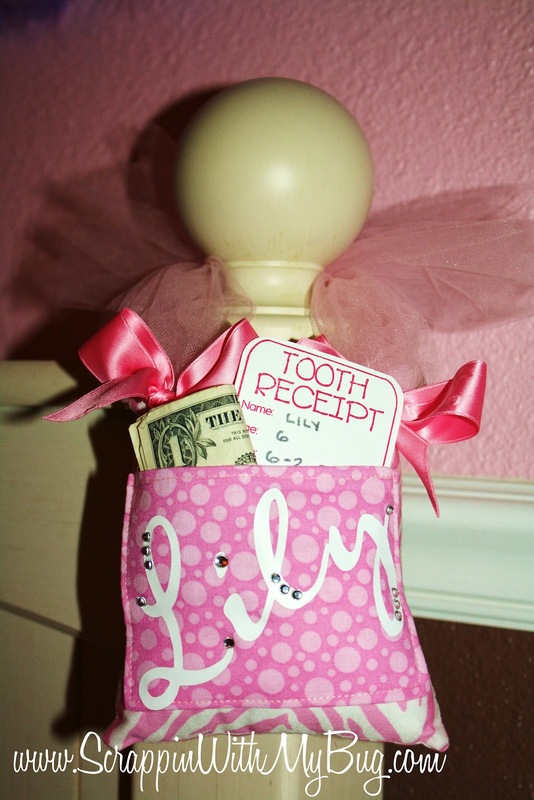 Happy National Tooth Fairy Day !! 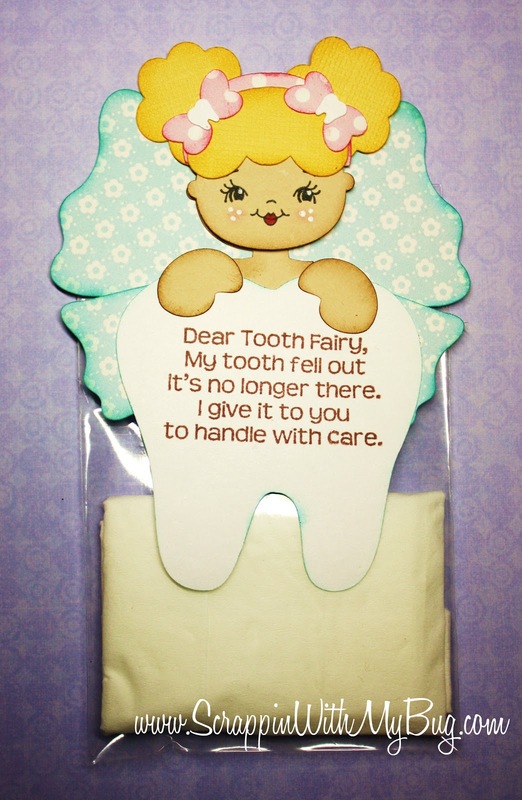 Happy National Tooth Fairy Day !!! I created a bag any child can put their tooth in and leave it beside their bed for the tooth fairy !! 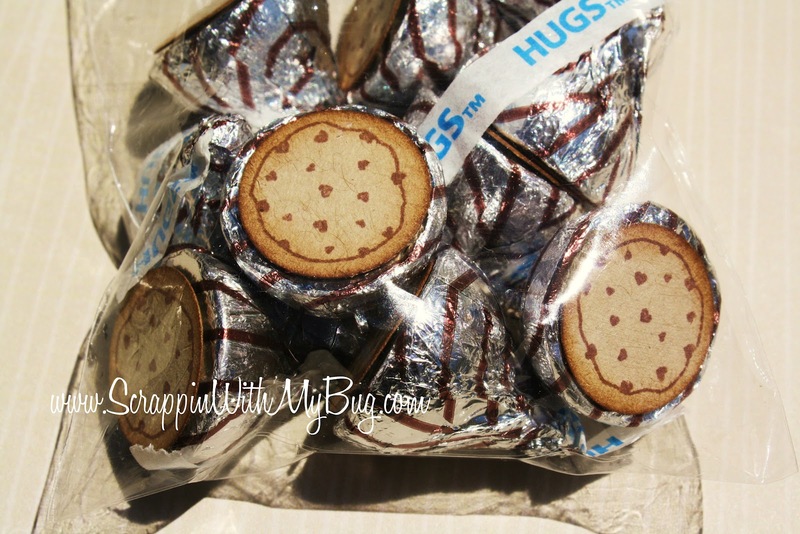 I used a Stamp tooth fairy poem from Jaded Blossom's "Tooth Notes" and their 3x4 treat bags!! KaDoodle it is called "Such a beautiful smile"
At Jaded Blossom today only is FREE Shipping !!!! whoo hoo !!! thanks so much for stopping by and Happy National Tooth Fairy Day !!! Have you seen the newest stamp of the month from Peachy Keen ??? 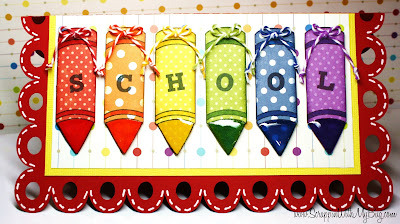 Its sooo cute and all about school !! 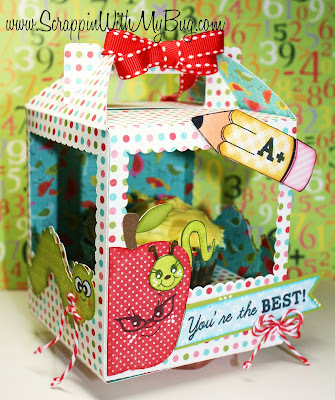 Also starting TODAY is a new Peachy Keen challenge!! 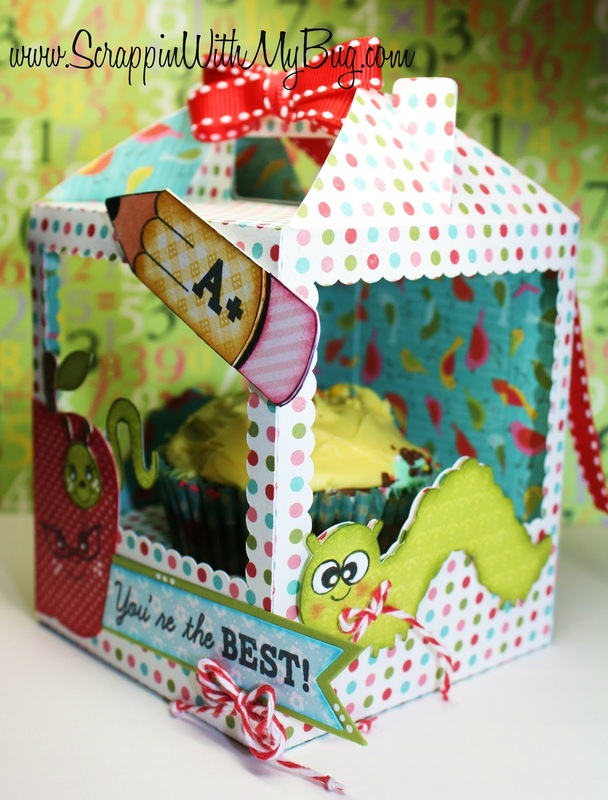 The challenge is to decorate any type of box so I made a cupcake box !!! Here's a side view of the box. I used a cut from the Silhouette store, Echo Park paper, Trendy twine, and of course Peachy Keen stamps !!! On the front again using the pencil from Peachy Keen. I paper pieced using Echo Park paper and Aluminum Foil. Of course after I was all done, I had my pictures taken and everything my husband asks "so.....why did you put a cupcake in there? Shouldn't of you put an apple instead?" 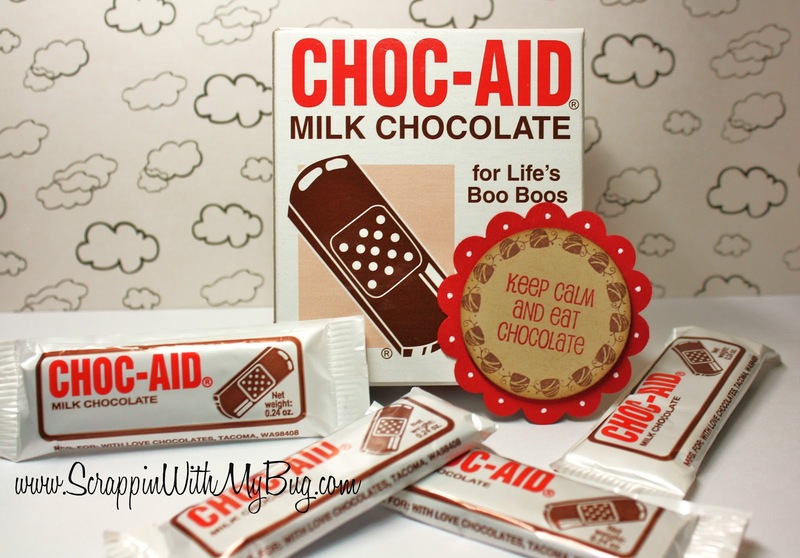 MMMMM That would of been a wonderful idea too !! LOL LOL ! 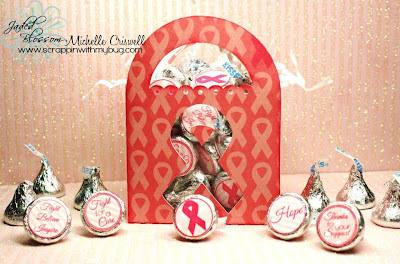 Peachy Keen Challenge Blog !!! 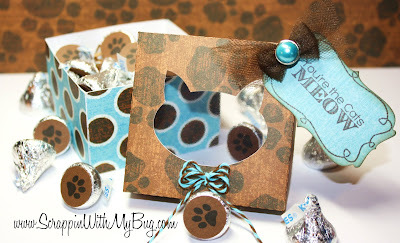 If you just came here from Jenny's blog then you are in the right spot! If not you can start at the beginning here at Jaded Blossom! !!! 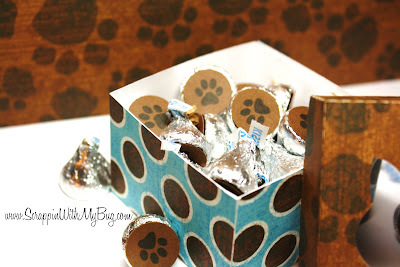 Most of my projects this week have been to show you how easy it is to use the Jaded Blossom stamps. Also that ANY skill level can use them. 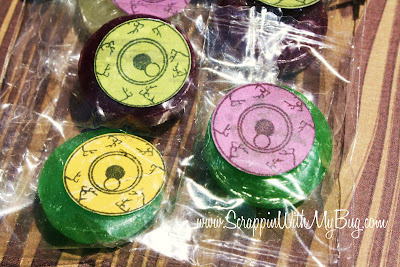 This past weekend I was in San Francisco and found these cute candies on the pier. 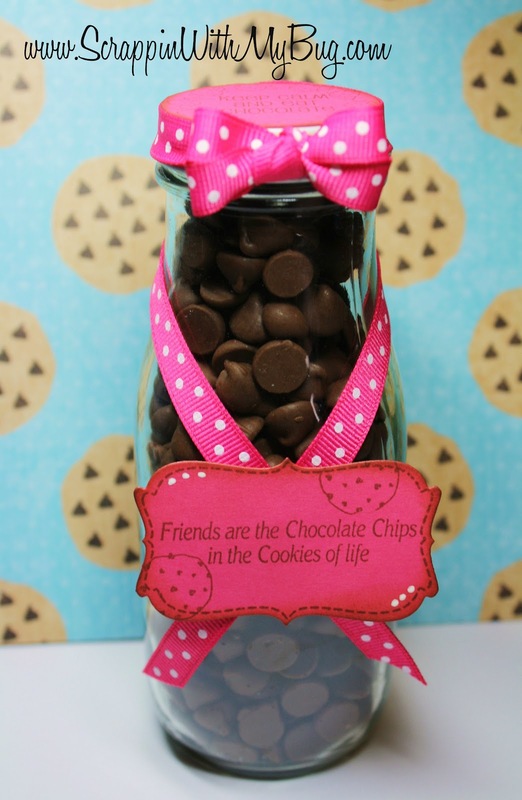 Again just adding a tag makes it so much cuter! This is the LAST stop on the hop! I hope you enjoyed it !! 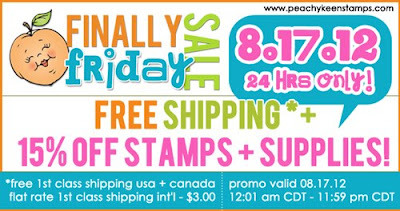 Please check out all these awesome stamps and feel free to shop! Also special pricing on the Release package this weekend only ! Ready for the last set before the Jaded Blossom Release and Hop tomorrow ??? 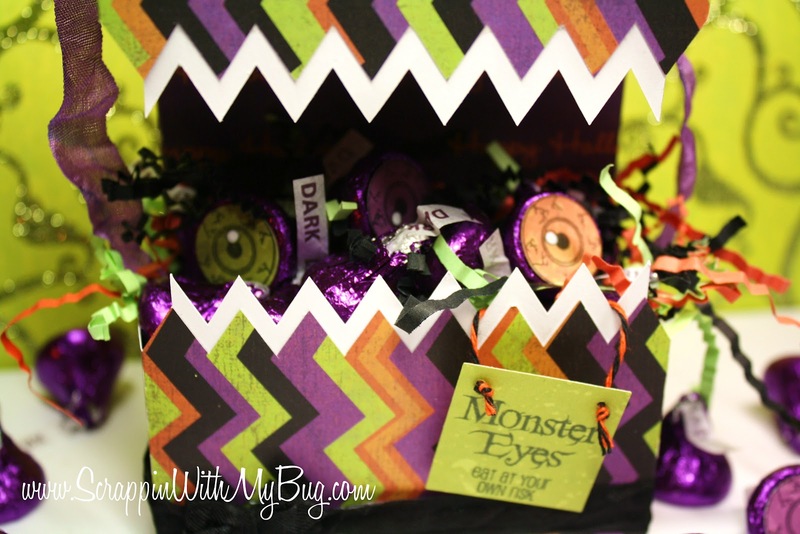 Today is all about Monsters! 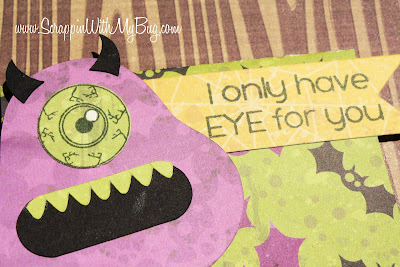 With the sneak of "Monster Mash"
I used the Jaded Blossom flag die, a sentiment from this set and the eyeballs are from this set as well. 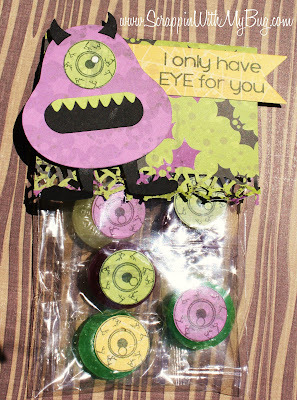 The eyeballs were punched with a 3/4" circle punch, and even used one on the Silhouette cut out as well!! 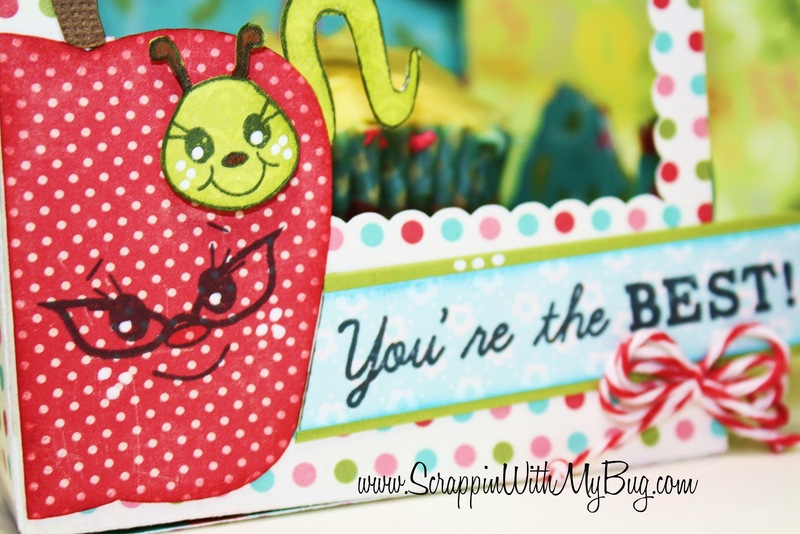 A simple cut from the Silhouette store and a Martha Stewart border punch ! 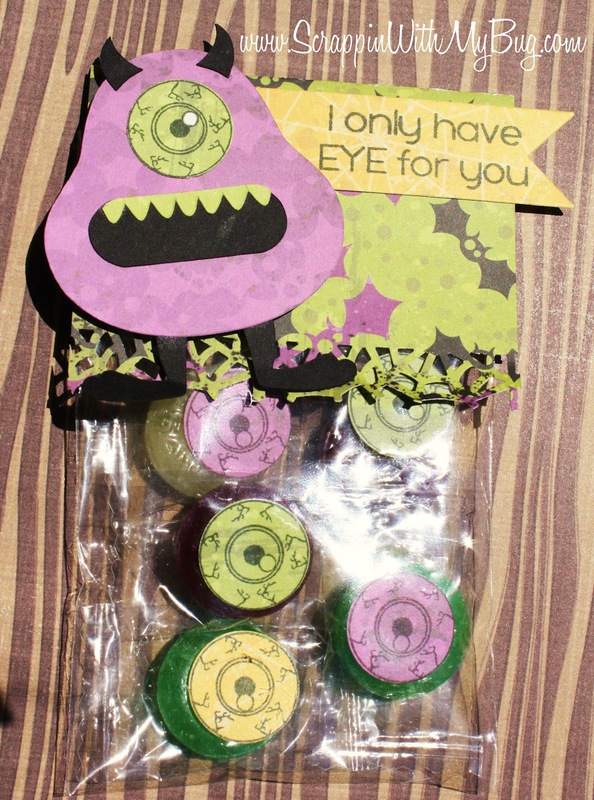 How cool are these eyes on the candy ??? Love how Jaded Blossom makes it so simple to make adorable treats! These will be perfect for school !!! Don't forget to join us tomorrow for the Release and the Hop at 4pm (PST) !! Hi Everyone !! Its day 3 of sneaks!!! Today's set is all about chocolate at Jaded Blossom! washed it and peeled off the label and filled it with chocolate chips. 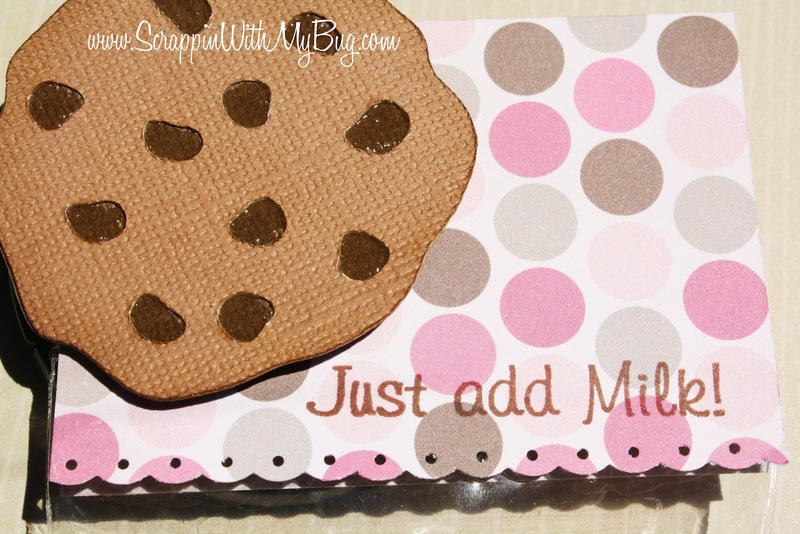 also the chocolate chip cookies from the "Milk & Cookies" stamp set. Of course the sentiment is from the new set "Chocolate Lovers" being showcased today! 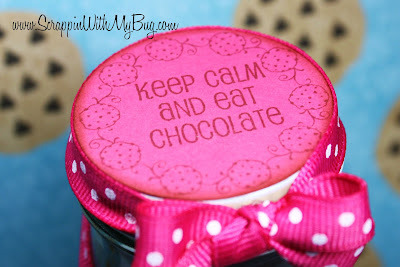 For the top I used a circle cookie stamp from "Milk & Cookies" it fits PERFECT on these lids I just used a 1 3/4" circle punch to punch it out. I love that you can create a cute easy project within minutes! and LOVE that these stamps and dies easily mix and match! I also wanted to share a card my daughter made. I had went to town when I came home this was on my desk, with no mess or evidence she had been in there. That little stinker used my new stamps before I got a chance to play !!! 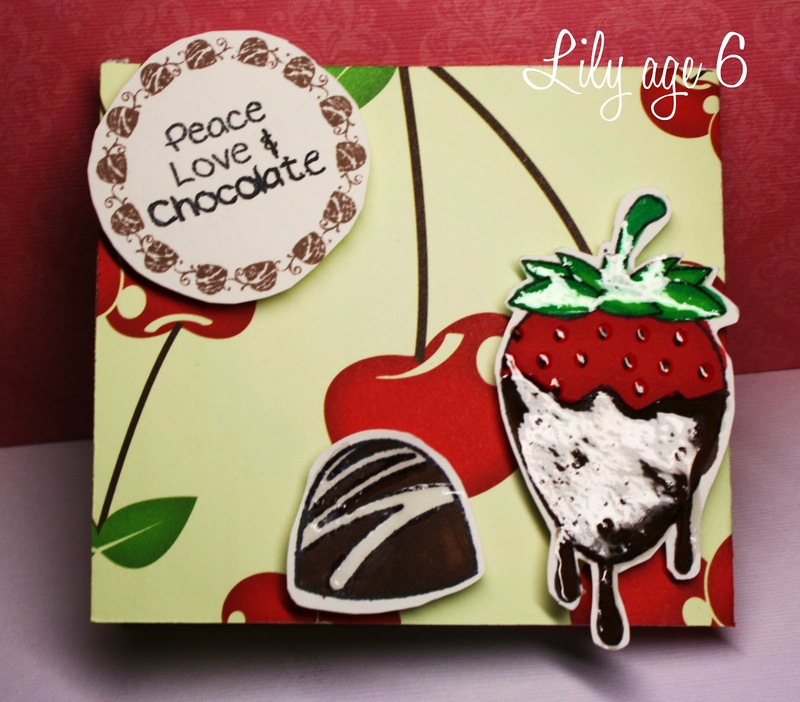 I love that she added glossy accents to the berry and the berry SEEDS !! I'm glad your back for another sneak !! 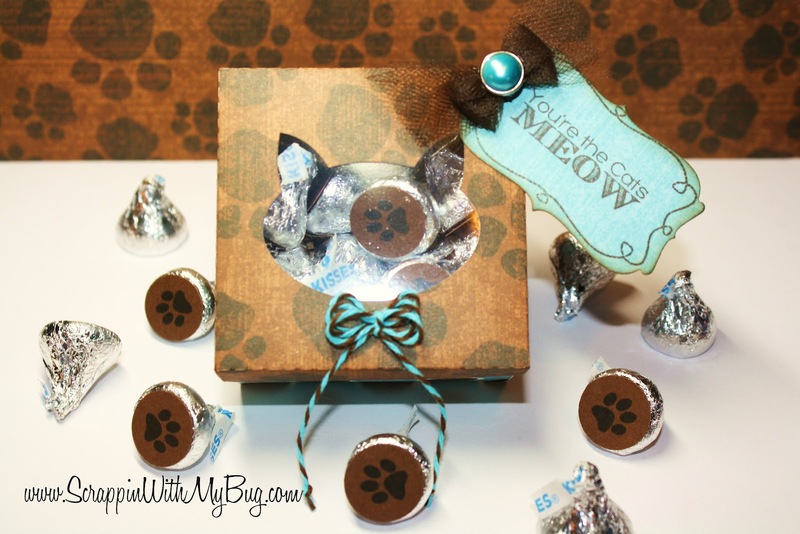 Today Jaded Blossom is sneaking Kitty Kitty for all you cat lovers out there !! 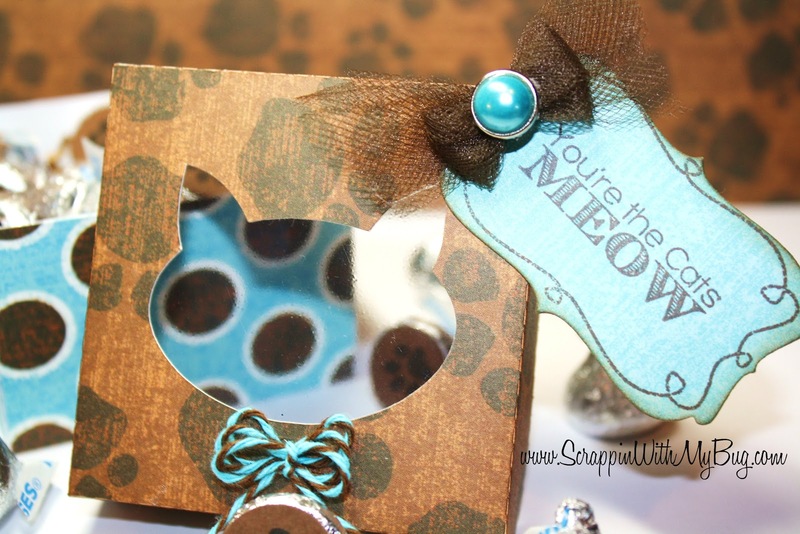 I used the Jaded Blossom Kitty Kitty set for the sentiment and the paw prints. I used a 3/4" punch to fit the kisses. I also used the NEW Jaded Blossom Die and stamp set Curly Everyday Borders. For the window I recycled acetate from my Cricut cartridge packaging and cut it down to size. Also added; tulle, a brad and some twine! The paper is from the pet stack of DCWV. 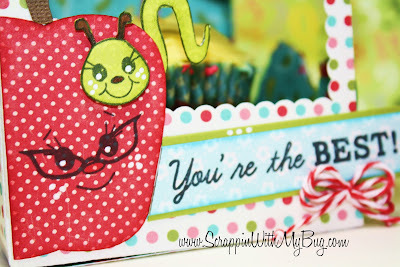 Here's a close up of the new die, and stamps !! Thanks so much for checking out the sneak of Kitty Kitty today !! 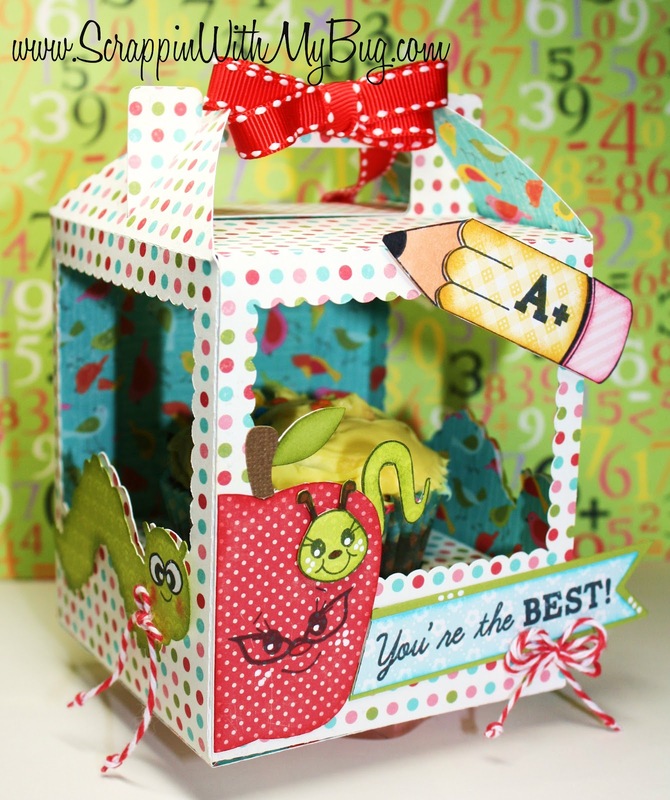 More projects from the rest of the Design Team on the blog !!! Hi Everyone !!! 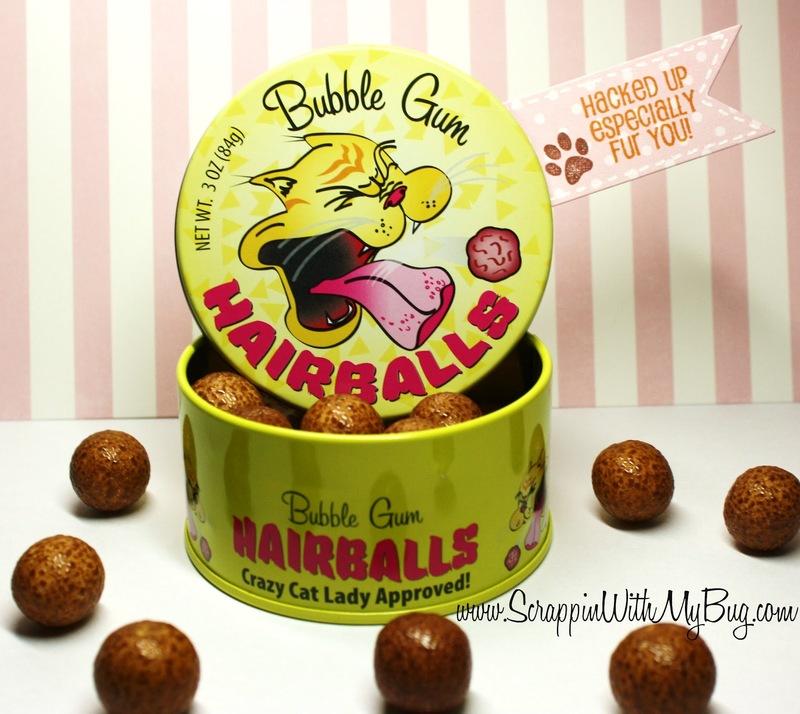 Jaded Blossom has a exciting release for you this week ! 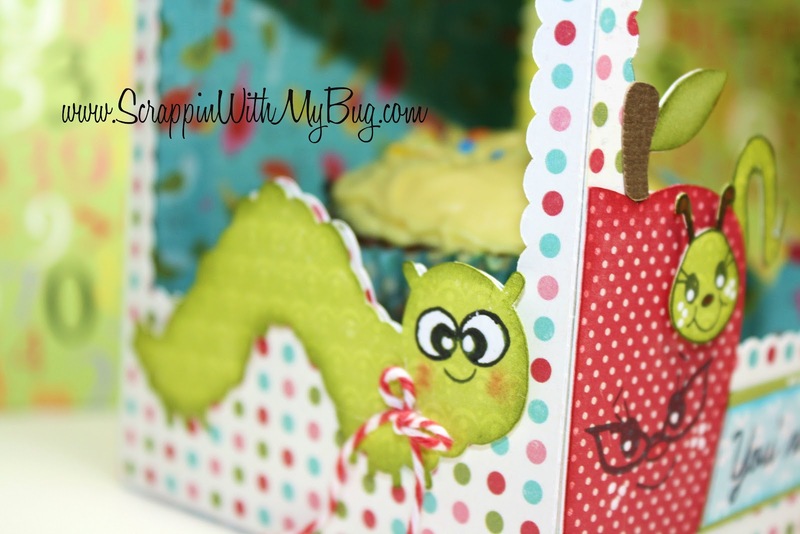 I will have a post Everyday with a blog hop on Friday !!! 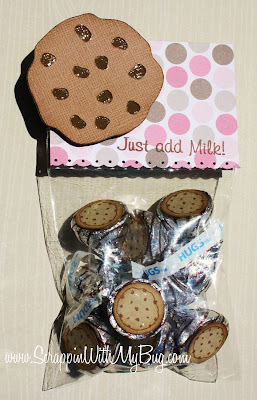 The first sneak is from the set Milk & Cookies. I used of course a sentiment from this set, also the small cookie shape and used a 3/4" punch. For the topper I used the cookie cut from the Sweet Shop Cricut cartridge and some glossy accents on the chocolate chips. Be sure to check back everyday this week and on the Jaded Blossom blog for all the projects made by the Design Team !!! 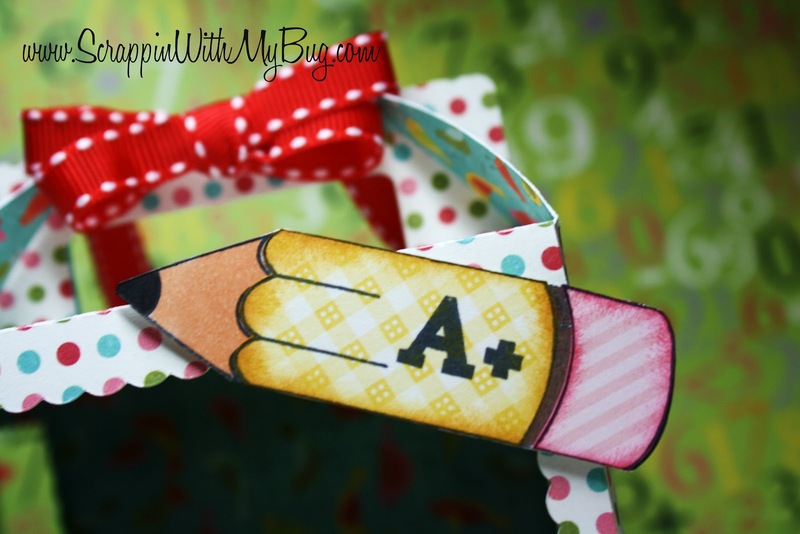 As you know the first Sunday of every month means a NEW Challenge over at Jaded Blossom !!! It just needs to have a Jaded Blossom stamp on it somewhere. 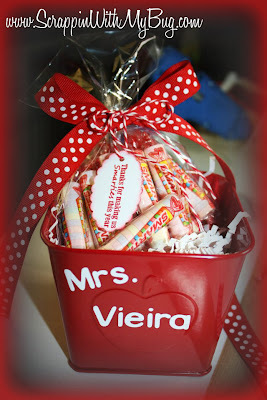 I created this treat tin for my daughters teacher. I found these cute apple tins in the dollar section of Target. 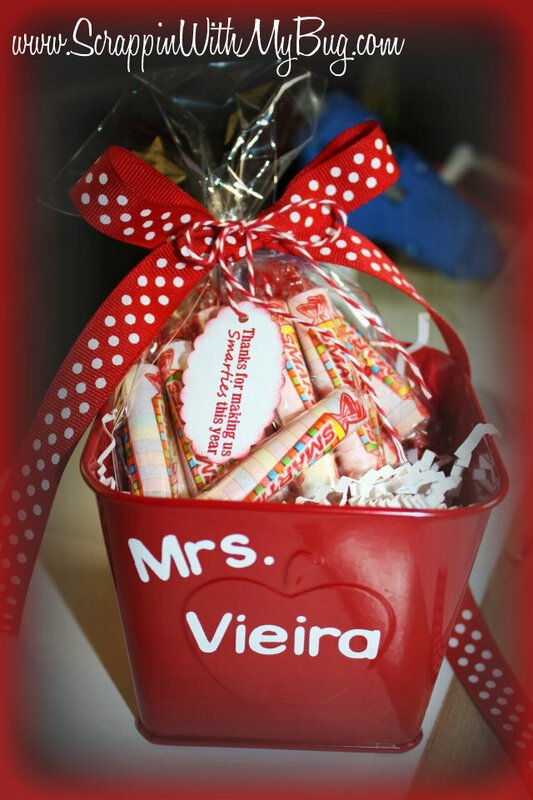 Then put in a bag of candy and tied it up with a cute tag and sentiment from Jaded Blossom off the Teacher Appreciation stamp set. 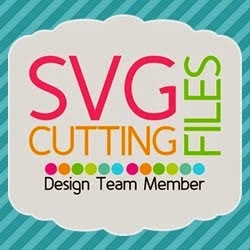 Make sure you visit all the projects from the Design Team and link up your own project !! The challenge is open for 2 weeks !!! Release week for Peachy Keen !!! HI Everyone !!! Its the 3rd of the month so its my day to show you a sneak of the NEW Peachy Keen SOTM set !!!! I created a very colorful card, that brings me back to grade school, where as a little girl I loved to draw rainbows and hearts with my crayons. I used the SOTM for the crayons and the sentiment. Also twine from the Twinery, Glossy Accents to make the crayons glossy, and a card base cut from the Silhouette store. 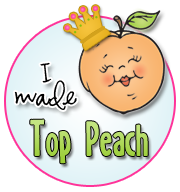 Make sure you head over to Peachy Keen to see all the projects from the designers this week !! !